Build your own storage shed with concise plans, material lists and illustrated step-by-step instructions from a shed building pro. Professional builder Fred Strickland has constructed more than a thousand sheds over his career. 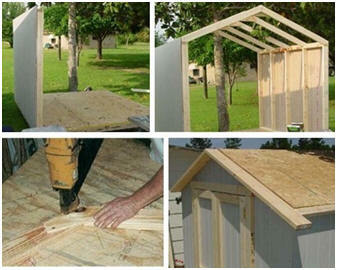 He put all of that experience to work for you when he designed these easy-to-build storage sheds. He developed simple methods to build roof trusses, doors, roof overhangs and attractive details. And, he explains them, clearly, in photographs and diagrams in a nine page instruction booklet that's included with each of his plan sets. All nineteen of Fred Strickland's Organizer Shed plans, with their material lists and building guides, are included in the Building Plans 101 collection. 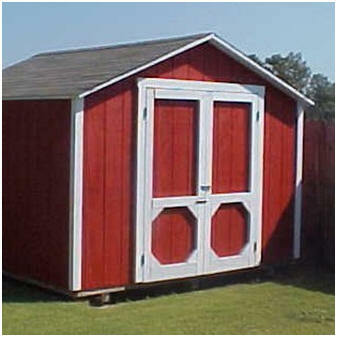 That set also includes dozens of other construction plans for all types of sheds, small barns, workshops and garages, as well as Fred's sixteen, do-it-yourself barn-roof shed plans. Order the $29 Building Plans 101 set and your plans will be delivered instantly by a link to an easy-to-use web page that will allow you to to download any and all of the plans and print as many copies of each as you'd like, as often as you like. And, your order will come with a sixty day money-back guarantee. Click on the links below to read more, to see more of the shed, barn, garage and workshop designs in the collection, to see floor plans or to order your copy of the Building Plans 101 set.